It's Easier. You know how hard it is to cut a spaghetti squash in half? Those gourds are hard! Well, you can cook it whole in the Instant Pot, and when it's done, the knife slices right through the soft skin. Better Texture. Have you ever eaten mushy spaghetti squash, that has no resemblance to actual spaghetti? By cooking the squash whole, the steam doesn't get inside. Result: ‘al dente' noodles that are a much closer pasta substitute. It's Faster. If you try to cook a whole spaghetti squash in the oven, it's going to take you about 90 minutes. If you cut it in half, it still takes 45. 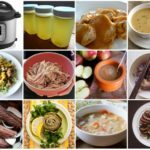 This recipe takes just 20 minutes in the Instant Pot. One Pot = Less Dishes. If you're like me, you are sick and tired of doing dishes. Thanks to the Sauté function on the Instant Pot, you can cook the squash AND the sauce in the same pot. Easy cleaning! P.S. 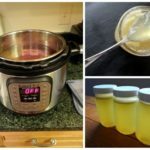 If you're new to the Instant Pot, listen to Episode 55 of the Phoenix Helix podcast for tips from the experts. Put the rack that came with your Instant Pot in the bottom of the stainless steel insert. Pour 1 cup water over it, and set spaghetti squash (whole) on top of the rack. Be sure the gasket is in place on the cover, and twist until it locks into place. Turn the pressure knob to “sealing” position, and click the “manual” button. The display will light up with the number “30”. Click the minus button until the display reads “20.” In a few seconds, the display will change to “On” which means the pot has started building up pressure. It takes about 11 minutes to reach full pressure, and then it will start counting down the cooking time (20 minutes). Update: If you bought your Instant Pot in 2018 or later, they updated their display panel. The “manual” button is now called “pressure cook”. When the Instant Pot beeps, click the “cancel” button to turn off the pot. Then carefully turn the pressure knob to the “venting” position. Be careful – when you do this, hot steam is going to come out of that knob. Just be sure to keep your hands and body clear, and turn the knob just slightly at first. As more pressure is released, you can turn it completely into the venting position, and you’ll feel the knob lift up. Once all the steam is released, you can open the pot. A safety measure on the pot is that the lid is pretty much impossible to turn, when it’s still under pressure. Remove the rack and empty the water. Put the stainless steel insert back into pot. Now it's time to make the sauce in the Instant Pot. Pour the apple juice into the stainless steel insert, and click the “sauté” button. The display will again light up saying “30” and beneath it the “normal” light will be lit. Click the “adjust” button until the display switches from “normal” to “more.” Wait a few seconds, and the main display will switch to “On”. Within a few minutes, the juice will start simmering. Let it simmer for about 3 minutes to reduce the liquid and concentrate the flavor. Then add the duck fat and stir until melted. Click the “cancel” button to turn off the Instant Pot. Update: If you bought your Instant Pot in 2018 or later, just click the sauté button repeatedly to switch from “normal” to “more” (the “adjust” button has been removed in newer models). 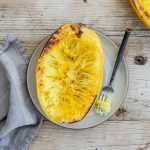 Scoop out the seeds from the spaghetti squash and throw them away. 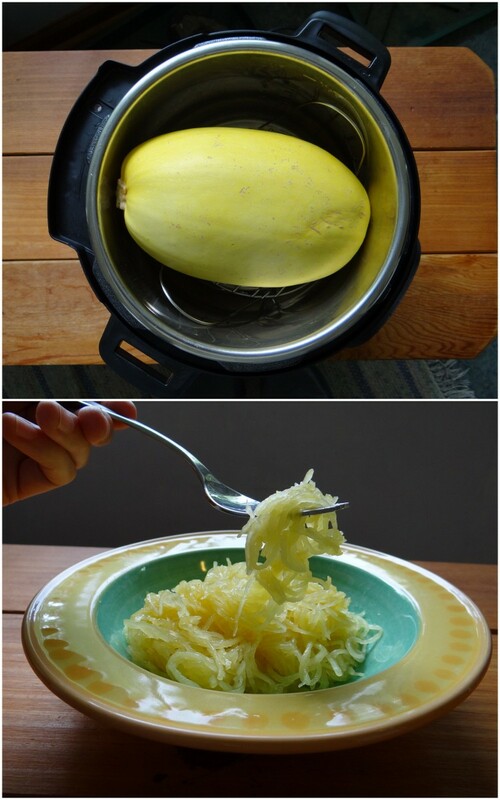 Then, use a fork to scrape the spaghetti squash noodles into the pot. Season generously with sea salt, and toss to coat evenly with the glaze. Taste, and add more salt if needed. Duck fat is one of my favorite fats. If you have another favorite fat, feel free to substitute. You can also use this recipe to simply cook the squash and top with other favorite sauces. Instead of the duck fat apple juice glaze, try pesto or tomato-less sauce. Add some protein to make it a meal. Lastly, there are some creative recipes that use cooked spaghetti squash as a base, like this spaghetti squash hash with chicken, bacon and kale. 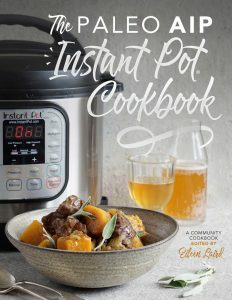 And if you want to cook another type of winter squash in the Instant Pot, it works the same way. 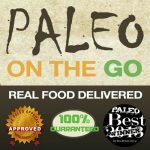 You might just need to increase or decrease the cooking time 5 or 10 minutes, depending on the size and type of squash. Have fun experimenting! Preheat oven to 375 degrees. With a small sharp knife, prick the whole squash all over. Place in a 9×13 pan and roast 45 minutes. Turn over and roast another 30-45 minutes, until tender when pierced with fork. Use hot pads to transfer squash to cutting board and cut in half. When cool enough to handle, scoop out the seeds and throw them away. Then, use a fork to scrape the spaghetti squash noodles into a large bowl. In a small saucepan, bring juice to a simmer over medium-high heat & simmer about 5 minutes to reduce and concentrate flavor. Add duck fat and stir to blend. Remove from heat and pour over the cooked squash. Season generously with sea salt, and toss to coat evenly with the glaze. Taste, and add more salt if needed.